UPDATE (8/11/09): Joseph will take orders! Choices will include real gator, imitation gator/croc (which looks almost exactly like the real thing), shagreen and various saddle leathers used by these guys. He'll probably need you to pay upfront (lots of supply costs for these) and it may take a few weeks. Email him at ItsMrPollard@gmail.com for prices, choices, etc. Nothing's cooler than when you see something amazing, tell its owner that you love it and the response is, "Oh, thanks! I made it!" We ran into the extremely nice and extremely well dressed Englishman, Joseph Pollard, last night at Fette Sau and our jaws practically dropped into the pork belly when he took out his alligator-covered iPhone. 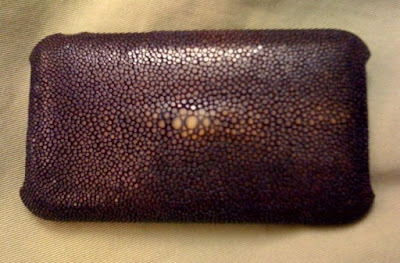 With the craftsmanship of a fine cobbler, he soaked, stretched and cut that skin to fit perfectly over an iPhone case -- and then he made one for his girlfriend in shagreen, below (which is like cutting through rubberized chain mail, he said). Pretty freakin' incredible. "Avoid fashion that makes your skin crawl"
I must say, in 52 years of life, I have never met anyone who has confessed to being able to get crafty with alligator skin. But there's always a first time, if we are lucky. 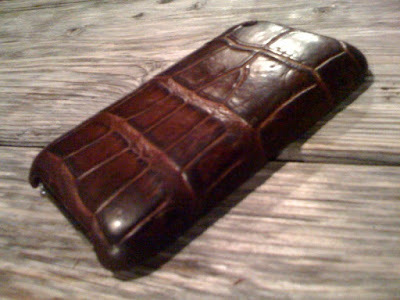 It's the 21st century' version of the Victorian alligator skin cigar case! That is awesome! I totally want one! How cool is that. Did he repurpose a vintage handbag for that? Oh what I would do for an Ostrich Skin iphone cover. Now I know it may be possible. Do you have a link or contact info for this man? I want one! Amazing, when can we meet him? Oh my gosh, how amazing! now that is self-proclaimed lux in the truest sense...do you think he'd accept commissions for other people's iPhones? and by other, I mean mine? I agree with Santino. When I read about this "antiquarian" style becoming trendy in the Times, I sincerely began to wonder if there would be a new generation of collectors clamoring for rhinoceros foot trash bins and dominoes made from ivory. Looks like my fears are to be realized. Think before you covet, people. I must have one! Please tell me he is not too cool to be concerned with the mundanities of commerce! Those are fabulous!I love exotic skins! Wow - truly incredible!! And sad - no purchasing info. I'll see if he'll take "orders"!